Palestinian Authority and Hamas condemn Israeli Prime Minister for saying Jerusalem will never be divided again. Prime Minister Binyamin Netanyahu’s pledge during Jerusalem Day that the capital will never be divided again was not well accepted by Palestinian Arabs. “I pledge that as Prime Minister I will continue to develop the city. 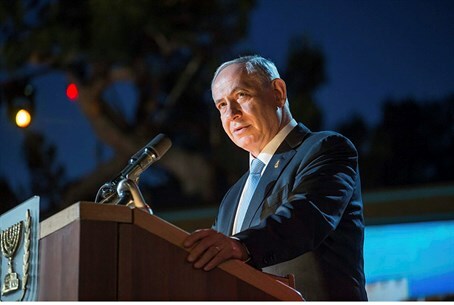 The city was united, and will never be divided again,” Netanyahu said at the Jerusalem Day celebration at the Mercaz Harav Yeshiva on Sunday. He made similar comments on Monday during a special Knesset session in honor of Jerusalem Day, saying Jerusalem will remain united regardless of any future negotiations with the PA.
"Jerusalem will not be divided again, it will not return to becoming a battlefield and a city of storybooks," Netanyahu said, adding, "We are building all over the city, including in the Arab neighborhoods. We do not build in Jerusalem to confront the international community, we do it responsibly and judiciously and that is our natural right." Later Monday, both the Palestinian Authority (PA) and the Hamas terrorist movement slammed Netanyahu over his remarks, according to the IANS news agency. Nabil Abu Rudeineh, a spokesman for PA chairman Mahmoud Abbas, said in a press statement that Netanyahu's remarks contradict UN resolutions and violate international conventions. "There will be no peace or settlement in the Middle East without having east Jerusalem as the capital of Palestinian state," Abu Rudeineh declared, according to IANS. He also slammed earlier remarks made by an Israeli minister in Netanyahu's cabinet, who stated that the Jews would soon pray at the Al-Aqsa Mosque in Jerusalem. "Such remarks will lead to a big fire that will be very hard to control either by the Arabs or the Muslims all over the world," warned Abu Rudeineh. Meanwhile, Hamas spokesman Sami Abu Zuhri said in an emailed press statement that Netanyahu's remarks that Jerusalem would not be divided "shows the failure of the so-called peace process". "Talking about the resumption of the so-called peace talks with the Israeli occupation while these remarks are mad is like thirsty people looking for water in the desert," Abu Zuhri said, according to IANS. Recently, Israel approved construction of 900 homes in the Jerusalem neighborhood of Ramat Shlomo, a haredi neighborhood in the eastern part of the capital. The State Department in Washington also condemned the move, calling it "disappointing" and "damaging".